Let yourself become immersed in the wonder of Hollywood and all that surrounds it. Click here to play! Have the movie experience right in front of your eyes as you play a visually simulating recreation of the spectacle of film in Movie Magic! 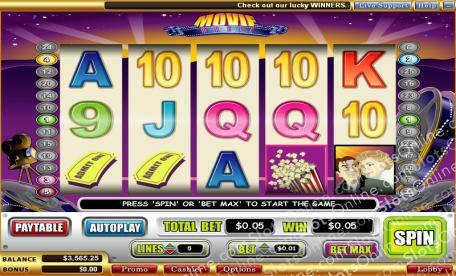 This 5-reel, 25 pay-line slot machine offers plenty of free spins as well as a $150,000 jackpot. Both Scatter and Wild are symbols in Movie Magic, with Wilds being interchangeable with every other symbol except Scatter. The Wilds symbol also triggers free spins when they appear. Only reels 2 and 4 accommodate a Wild Popcorn symbol, so when 1 or both appear you will be awarded anywhere between 2 and 25 free spins according to how many active pay-lines the Popcorn are on. Will you become one of the richest stars to walk Hollywood Boulevard? Find out when you play alongside the celebrities in Movie Magic! The Scatter symbol in Movie Magic is the Film Reel. It pays out when 2 or more appear in one spin. The Popcorn symbol is Wild and is only played on reels 2 and 4. If one or more appear at once you will be rewarded with a certain amount of free spins respective to how many pay-lines are activated.